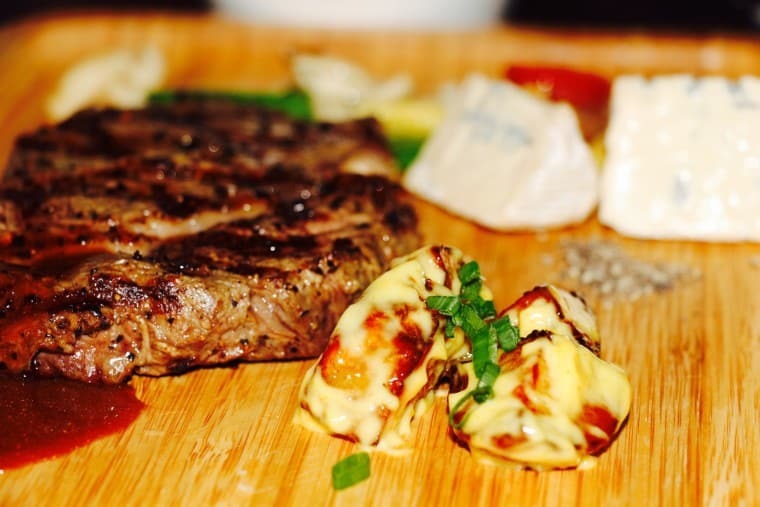 Top 10 restaurants in Siglap | Is Life a Recipe? 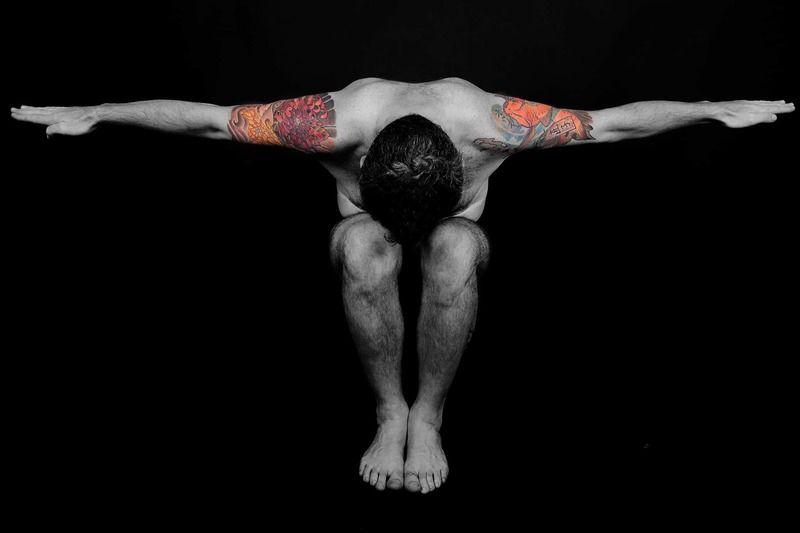 A first for The Semi-Naked Chef and the first for my blog. I have never done a Top 10 before. I have written about my favourite hawkers before, which also featured in EXmag. But this was specifically a review of some favourite things at East Coast Lagoon Hawker. This is now my very first review of Top 10 restaurants in Siglap, yep I am keeping it local. I hope you use the recommendations. I hope you pass it on. My family and I love these places, and are always in and out of them, stuffing our faces with what I believe is some of the best food in Singapore and potentially the world. 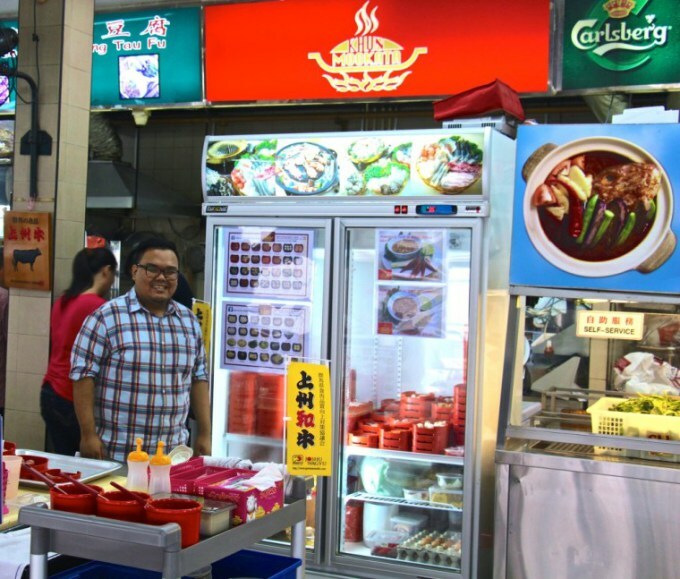 We are very lucky indeed to live in Siglap, which to be quite honest is turning into a wee bit of a food mecca for me – wet eat it, it influences me, we have made friends through it, it is just amazing. Here come The Semi-Naked Chef, Top 10 restaurants in Siglap. I’ll caveat now this is in no order of preference. This is one of those places that you simply have to come visit once in your life. Come see Dave and Bing Lim at Empress Place @ LTN foodcourt in Siglap. If you want one of the best soups you ever did eat, you will get that experience here. The beef kway teow is just exceptional. Secret recipes all round, that have received many rewards and accolades. It is simply one of the best you will ever have. Just look at the photo, that cloudy broth is laden with beef bone marrow. Little green flecks of celery stalk. Bean sprouts. Freshly made noodles. 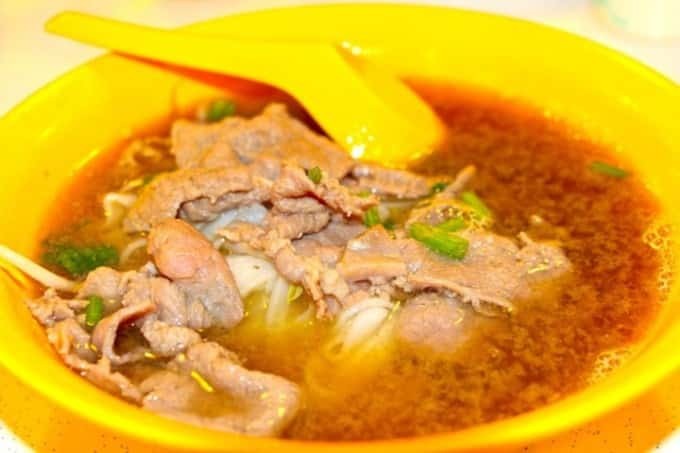 And thinly sliced beef steak that is raw on entering and then lightly poached in the hot beef broth. An OMG moment. You must come. Easily in my top 10. If you want to eat like Royalty come see Greg at Khun Mookata @ Siglap. Nestled in a foodcourt is this mecca. He is an ex Japanese Chef, and with that background has taken Mookata to another level. Mookata is basically the Thai version of steamboat. Grilled meat or fish on a portable burner, with a soup tray running around the grill. So as you cook in to the broth go the cooking juices. Just that alone is alone to get me fidgeting. But then add to that the fact that the meat is Japanese Wagyu and Iberian Pork. Yep I know. I nearly tipped the table over thinking about it. Greg’s genius, brings the VERY best meat you can buy to a food-court. A die die must [email protected] try in my very humble opinion. How could you not want to eat that. This is a signature green chili prata from Springleaf Prata Place. Holy crap this is good. But this is just one item. They do so so much more. And you should come a few times and try them all. Of course these all come with a truly wonderful curry sauce for dipping. They have fish head curries, murtabaks, pratas and much much more. Only down-side is no beer – boy could that be the perfect bed-fellow for this food. But nonetheless this is chosen last meal status. It is so good. 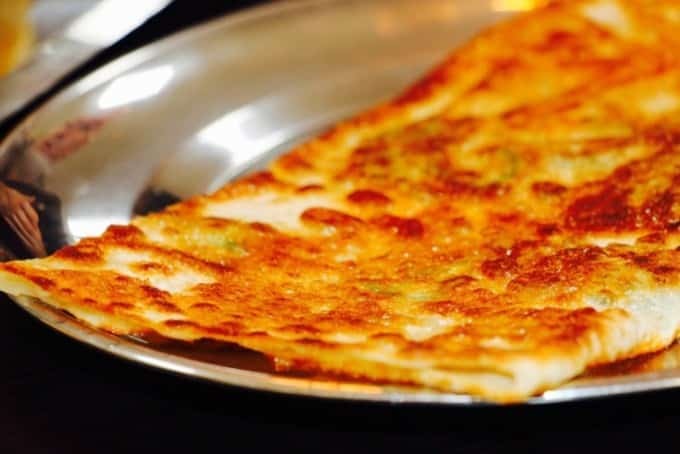 This green chili prata is top of the shop for me, but the rest truly are the best too. Get yourself to the secluded side streets of Siglap and enjoy the food here. A must try for all the family. Believe me. 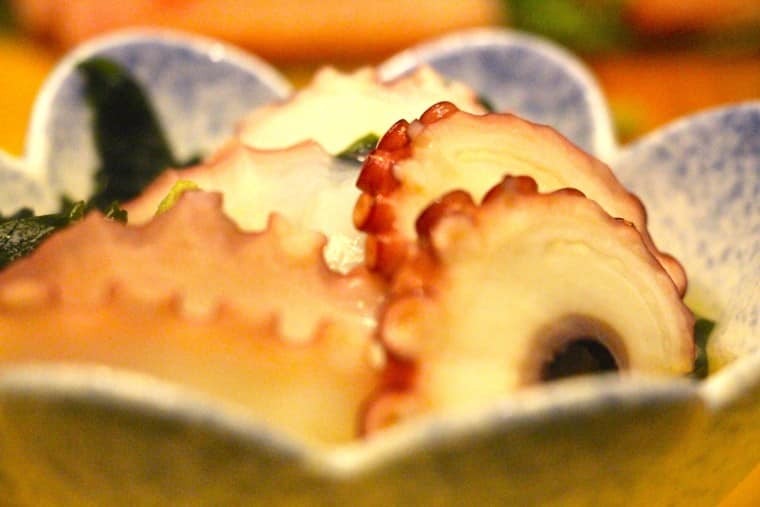 If you like quality Japanese food from a friendly family restaurant, then look no further. Here it is. Megumi Japanese Restaurant in Siglap. We keep going back to this place, it’s really really good, you just can’t help yourself. Food is fantastic, it’s so fresh. The staff are wonderfully friendly. You just get that vibe, that warm welcoming atmosphere. 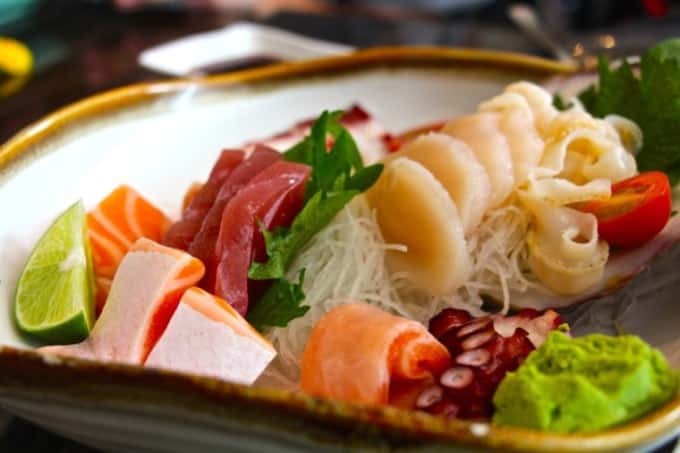 A complete variety from sushi/sashimi, ramen, tonkatsu, to delicious desserts and more. It’s just a great place to chill with the family and eat til you burst. It’s a place you can never tire of and from our side it has also been ‘validated’ by my Mother-in-law from Japan. She gives a big thumbs up too. That seals it as a Top 10 for me. Not in the centre of Siglap. Just a little way round the corner. This is Gourmet Bistro on East Coast. For us though this is a well worth a 10 minute walk to eat. A fantastic menu. Varied, and a little tapas in style. So gorge yourself on the variety of taster dishes – I can’t fault a single one. 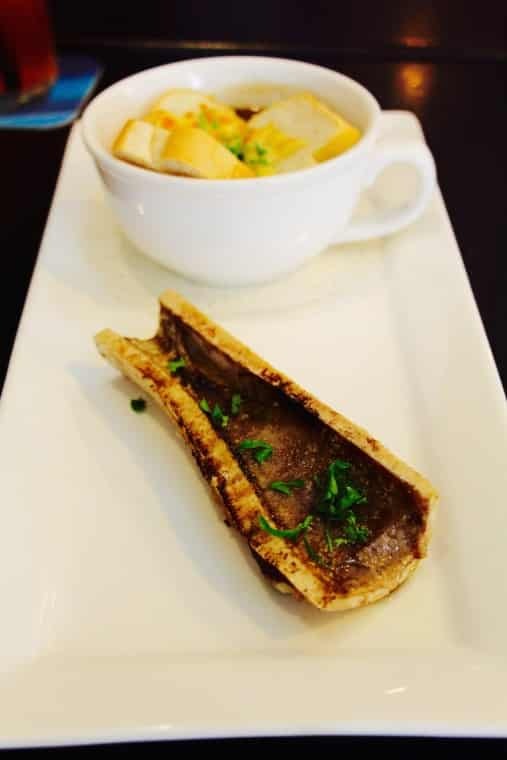 I have chosen as the photo for this place the onion soup with accompanying roasted bone marrow. In my reckoning there are not many better dishes I have ever eaten, and this is just one of their array of fine food. I will go back time after time just for this one though. We absolutely love this place. Staff again augment the food. All so friendly and attentive – you get bloody good service. It’s seriously up there on the “should have an award-arometer” – it really is that good. There is really too much to comment on from the menu individually here, as this is just a head-line review of my Top 10 – but check the blog link for more insight. A MUST!!! Again merely a 10 minute walk for us, but I’d also take a 10 minute cab (or more) to keep coming back here. Even if we moved from Siglap we’d be coming back here to Perle Noire. The Chef is incredible. He has such a small staff in the kitchen but continues to churn out incredibly high quality and delicious dishes to an eagerly awaiting audience – it really is impressive. You’ll see from the above I chose the wagyu steak with foie gras as my photo to represent my love of this joint. I mean come on why would you not want to come here just for this dish. It is an absolute corker. See that little blurry bit of blue cheese in the background – I mean come on!!! Perle Noire you are killing me ha ha! Again for me the atmos is important, especially with 3 kids in tow and this place has that – it’s warm and inviting (I don’t mean no aircon), and the staff are just great and then they bring out just some of the very best food this big mouth has ever chewed upon – it’s a must one time visit for you, because then I know you’ll be back!!! Back to LTN food court, and literally to the back. 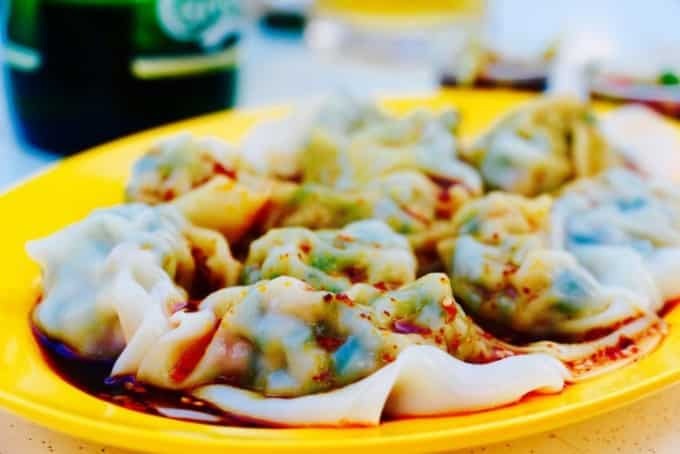 Nestled there is a place that does Shandong Dumplings (a must), but also these things called red oil wanton. So I am giving this a Top 10 restaurant review, without it being a restaurant per se. But it is a dish/dishes you should come and try, it just so happens it is in a food court. All the noodles and wanton wrappers are hand made right there and then – in fact you can stand and watch the master craftsman at work as he pounds out the delectable delights in front of your eyes. Little wrappers here are then filled with secret ingredient mixtures, then boiled and when cooked covered in this special red oil sauce. You just gotta try this. It is spicy, oily, savoury, scrumptious. You want more and more and more. Oh yeah and pop to see the Uncle next door for some cold beverage which is the perfect bed-fellow for this. You really should try this one time, because if you don’t you really are missing out on something unique. Neighbours of ours are Sushi Jiro Restaurant, literally just across the road in fact. Blink and you’ll miss this place. It’s sort of squeezed in between other building, not much signage, but look for the latticed sliding doors. Very Japanese in style. Read the blog to get the address and contact details. One down-side of this place is it is pricy, but still absolutely deserves a Top 10 slot, because it is good, and I really do mean good. For us this is a special treat location. Somewhere to celebrate something. But celebrate you will. It is top drawer. If you want quality Japanese in Singapore, then come here. I don’t think you’ll find better anywhere. You have to try the fugu (puffer fish) as that was a WOW moment, and so so much more. 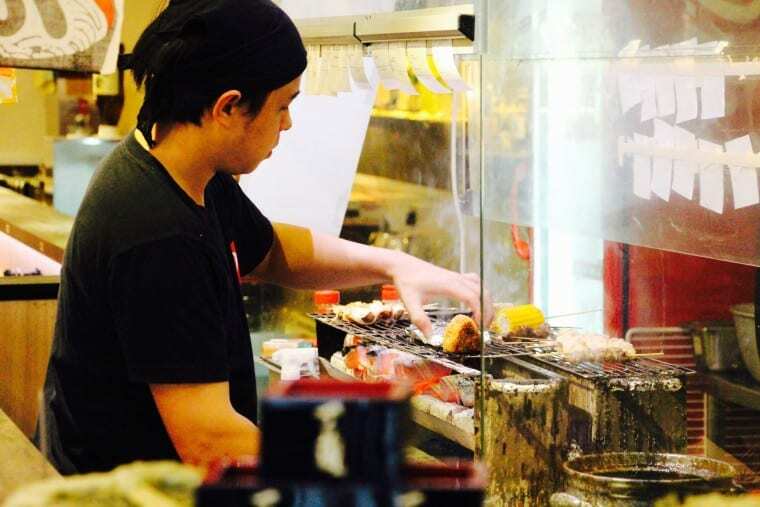 Save up, get here – you will NOT be disappointed, Sushi Jiro is a Siglap Mecca, in fact Singapore Mecca!!! Next up is Jin Wee Restaurant a literal 5 minute walk for us to this little place. Usually with people spilling out from the inside to the boardwalk area outside, and even to the shops 2 doors down. Yep it’s popular folks. You can’t miss it. 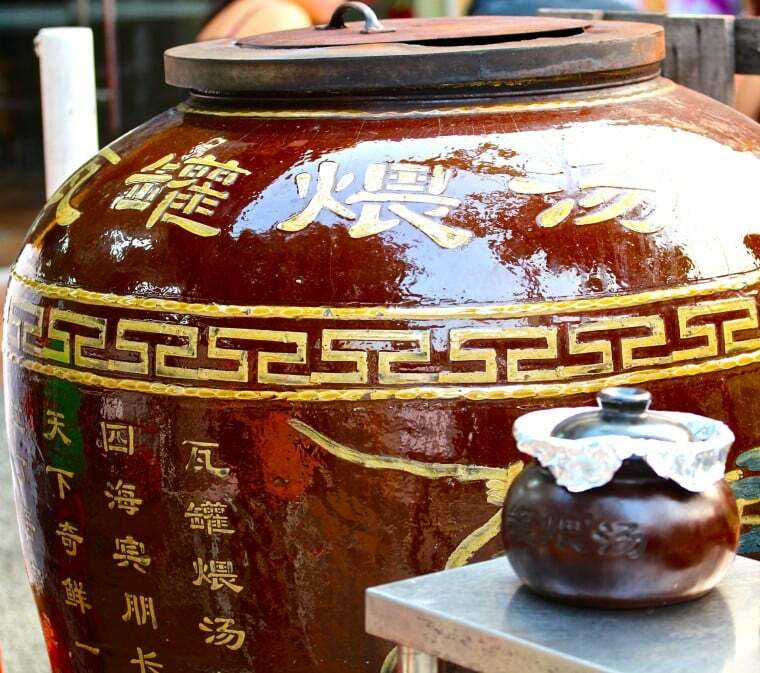 Just look for the HUGE earthenware pot out the front, as in the picture above. That is not for show. That is part of the kitchen. So you have a small claypot with soup inside (see the silver foil covered one in the foreground?) and then inside the big earthenware pot are loads of the small ones all stacked up inside. Beneath the big pot are coals sending heat in to the inside, and of course smoky charcoaly flavour. You have to read the blog to see the charcoal Jiao Hua Chicken soup – OMG moment just came flooding back. I’d queue for that again and again. Fall off the bone chicken in this greasy intensely flavoured chicken soup. Without a doubt the best chicken soup I have ever had. But don’t just come for that, there is so so much more. Bring one, bring em all – you really should. Now I don’t know if you have read my blog on this place, but please do so from the link above. I gave them a balanced review because the service was a little shoddy the night we went, but man did the food make up for it. So yes we went back to Mikawa Yakatori Bar, as I committed, and everything was on the money the second time. This place came as a recommendation from my mate at Khun Mookata, Greg, and thanks to him that he did as this is a cracker of a new place in Siglap. Yakatori is like Japanese tapas, so you can order and order and order – and I recommend you do. Every single dish you will consume is highly rated by me. There is not one I would not have again, in fact some we ordered 2 or 3 again in the same sitting. Yes, it really is that good. Book though folks as this place gets really really busy. So there you have it folks. My Top 10 restaurants in Siglap. These places deserve Michelin stars in my personal and humble opinion. Putting it plainly we eat bloody well in Siglap. It is a concentration of food in a small suburb of Singapore. A suburb that gets a 5* rating from me as a food mecca. The Semi-Naked Chef lives here, I eat here, I cook here – and now you should eat here too. Take your pick, you have 10 belters to choose from. ENJOY!!! No Replies to "Top 10 restaurants in Siglap"